The South African War (also known as the Second Anglo-Boer War) was the first overseas conflict to involve New Zealand troops. Fought between the British Empire and the Boer South African Republic (Transvaal) and its Orange Free State ally, it was the culmination of long-standing tensions in southern Africa. Eager to display New Zealand's commitment to the British Empire, Premier Richard Seddon had offered to send troops two weeks before fighting began. Hundreds of men applied to serve, and by the time the war began in October 1899, the First Contingent was already preparing to depart for South Africa. Within a few months they would be fighting the Boers. By the time peace was concluded 2½ years later, 10 contingents of volunteers totalling more than 6500 men (plus 8000 horses) had sailed for South Africa, along with doctors, nurses, veterinary surgeons and about 20 schoolteachers. Seventy-one New Zealanders were killed in action or died of wounds, with another 159 dying in accidents or from disease. 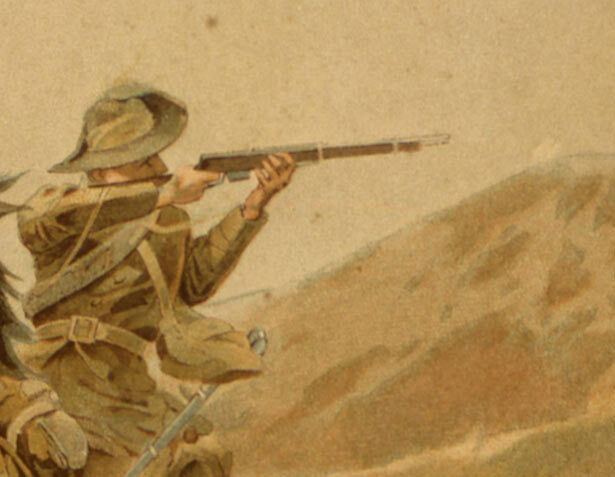 The South African War set the pattern for New Zealand’s later involvement in two world wars. Specially raised units which included many volunteers were despatched overseas to serve alongside forces from other parts of the British Empire. Their success in battle fostered the idea that New Zealanders were natural soldiers who needed little training to fight well. We have 2 events in history, 5 biographies, 4 articles, related to South African 'Boer' War.